Last week I answered the question... how do I keep my floors shiny? My second most asked question is where do I store my linens and pillows? 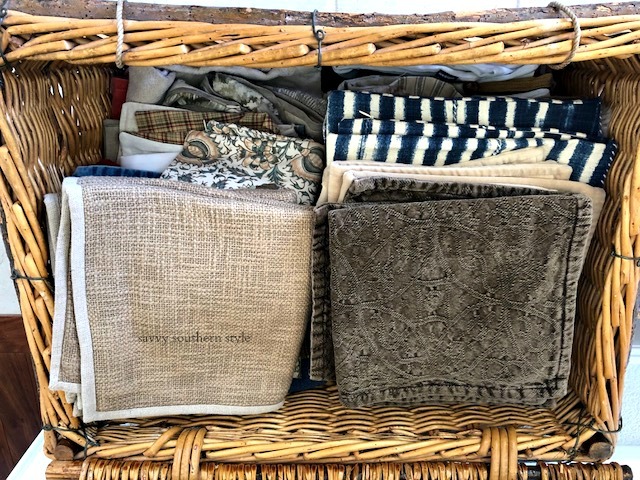 If you follow my blog then you know I change out the linens on the beds and the pillows around the house seasonally and to give y'all some inspiration and ideas for your own home. 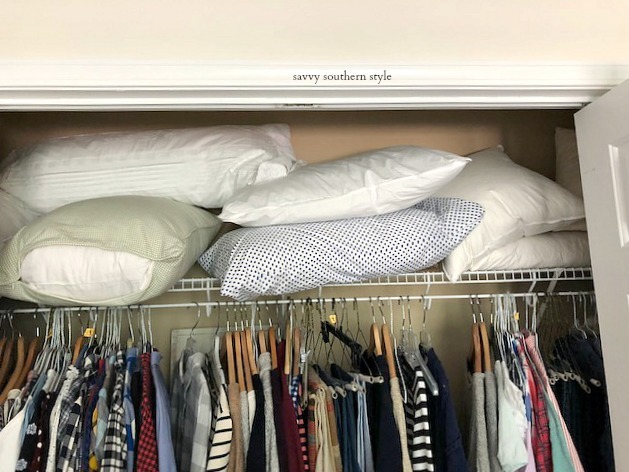 Of course since I do refresh things often the linens and pillows have to be stored somewhere when not in use and/or until I purge things out. As you will see I am NOT an organized person and I hope to tackle this mess soon. So folks this is real life and this is not a post filled with pretty photos. First we will start with a pretty photo of the master bedroom last fall since I don't won't the first photo on my blog to be ugly. The closets are busting at the seams. There is the duvet in the photo above waiting to be used again soon. The floors are covered along with the shelves. The armoire in the farmhouse style guestroom is full. What a mess. Just shove it in and shut the doors. Even the chest in the foyer isn't safe from my storage needs. And this large vintage lidded basket in the sunroom is packed full of pillow covers. I am not a hoarder. I am not a hoarder. I am not a hoarder. Now, I just need to find time to purge and straighten all this mess up. Please ask me more questions in the comments or suggestions for blog posts. 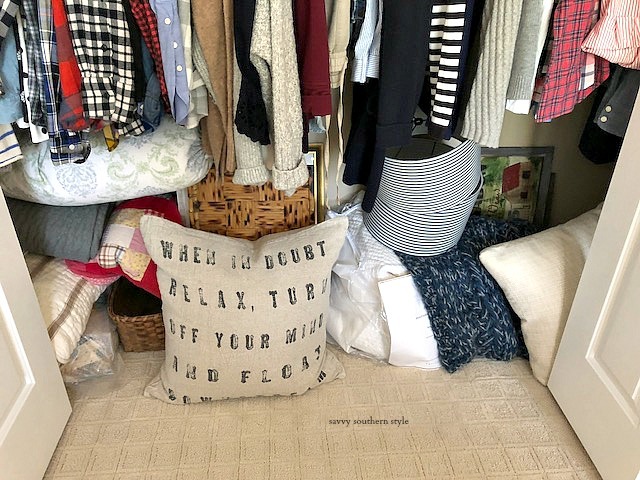 You are not a hoarder but you definitely have the best collection of linens and pillows! You are cracking me up! Thanks for the laughs!! LOL All you need to do is get rid of some of the pillow inserts. I no longer buy, make, or have made, complete pillows. Covers only. I keep cream colored bedding on the beds in Master and guest room and only change out shams, duvets, etc. but I don't do that as often as you or have as many. I do love storing the duvets, covers, etc. in chests. 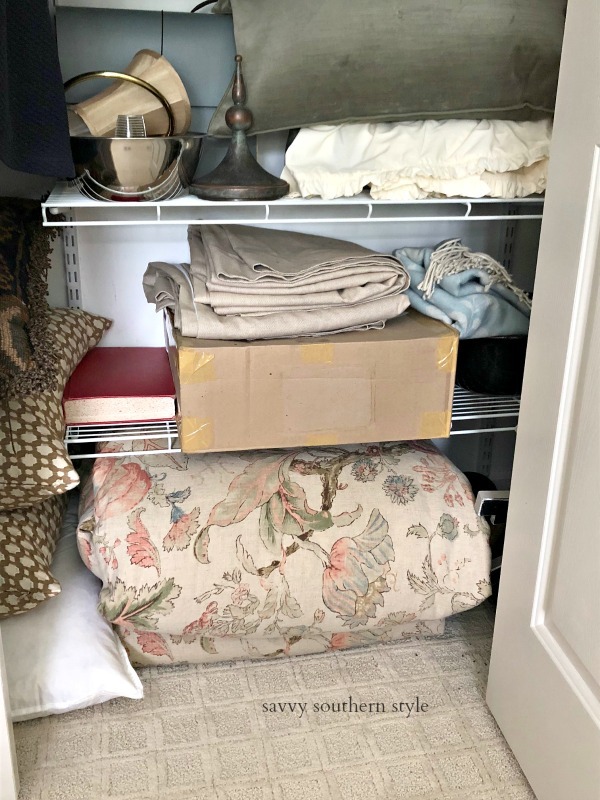 Once closet has an area for pillow forms and I did pare that down in the past year as all those pillows were becoming a pain! BTW, I spy that brown/blue plaid blanket in one of your pics - so pretty! I think it looks pretty organized! Love these realistic photos and I had to laugh when you said you had to include a pretty photo of your bedroom, since it was the first photo. I could really use some time to clean out my closets, the linen closet, etc.!! Maybe when the kids are back in school! Whew! 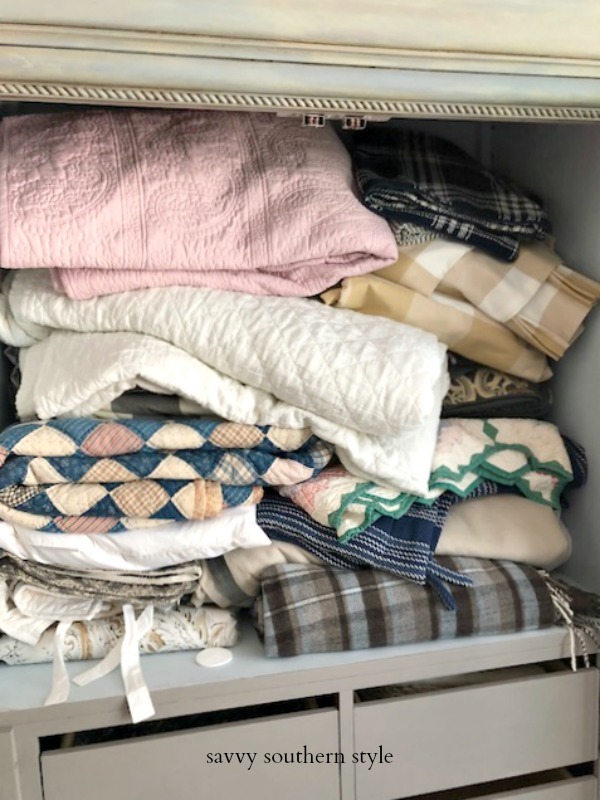 I love this post and was eager to see how you stored the multitude of linens that you encompass into your bed making! Thank you thank you thank you, for providing lustful inspiration. I relish all your bed linens and bed making styles. Really, I do. It looks way better than how I store stuff and I don’t have nearly what you have. Have some sweet tea and don’t worry about it. You are doing great! Hoarders don't use things, they just keep adding for the sake of having more. At least that's the way I look at it. I have lots of pillows and linens too, but they get used at some time during the year. Yes, I could live with less, and probably should, but I love beautiful linens. I try to only buy pillow covers and use the pillow inserts with different covers. That works well sometimes, but not always! I also have a nice collection of vintage and antique quilts that I rotate around on various beds. Others stay stacked or stored in trunks. The collecting bug attacked me at a young age and never released its grip. Love seeing your pretty linens! 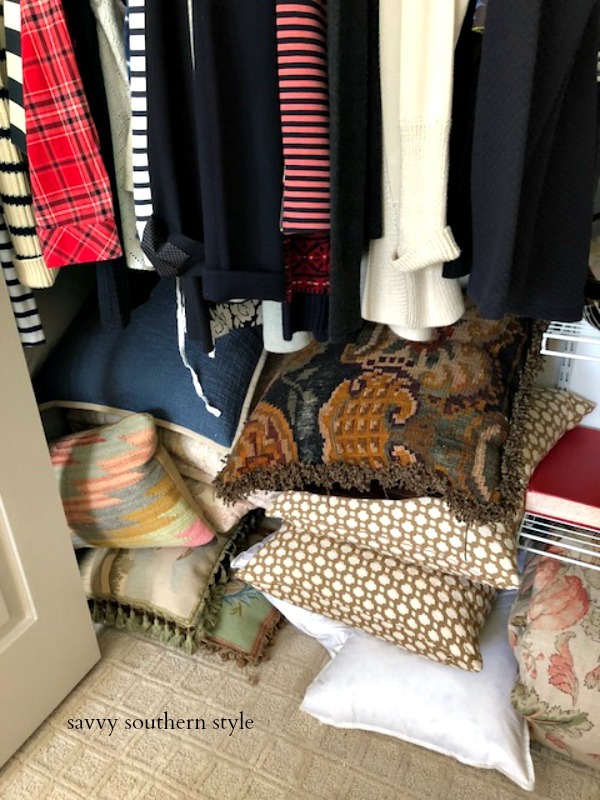 I think we all have "that closet" .... at least you seem to have your pillow covers very organized according to color, season, etc!...the tall chest that hubby used to have clothes in is now filled with linens...have a most beautiful day Kim! Kim, my closets and shelves look identical, except table linens. I organize and two weeks later it is all a mess again. Have a lovely Wednesday! Oh, how I love this post. I store all of my linens the same way and it is so good knowing I am not alone in my pillow cover & blanket obsession. Linens make changing up the look of a space so easy especially since I love several different decor styles. Kim, you have such a knack for recombining different colors and patterns into congruent and lovely new "suites." Do you see what I see? All those quilts and pillow covers and decor pieces in your skilled hands, could become a display set all their own! Stacked, folded, grouped, arranged, in a glass front bookcase or such, you would get double use and enjoyment out of your collection--and so would we. Thanks for sharing your talent and beauty with us. I really do love seeing what you'll make next! 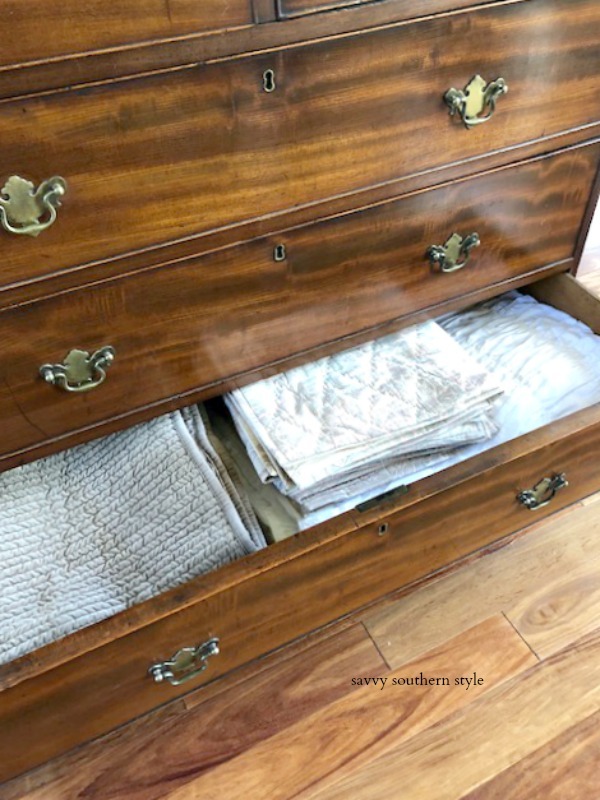 Ooh I spy a quilt in your guest room armoire I would love to have! ;-) Always love your bed stylings!! Smiling! Smiling! Smiling! I feel better knowing I'm not the only one! I love to change out bedding (usually seasonally) and in my world, there are not enough pillows! I AM trying to convert to more pillow covers...and I'm SLOWLY beginning to purge...ok, not really...but I THINK about it! Thank you for sharing!!! Thank you for sharing so that I know I'm not alone. Mine are in the hall closet, guest room closets, guest room chest, a big wicker trunk and a steamer trunk. I've cut down because we've downsized and space is at a premium but still all those places are stashing places because I like to change things up seasonally as well. Kim this was one of the best posts ever. Because its real. We all love your home and all wish ours was like yours. It's beautiful. It is nice to see how real your closets are as it shows we all have stuffed closets! Even those who have the most beautiful homes! Like yours! I love this post! Thank you for being so real! !And for sharing it all!! Oh boy...I hear you on the linen storage issue Kim! I store mine in an old wood cabinet in our master bedroom because we have a serious lack of storage in our home. What were they thinking in 1962 when Florida homes were built without storage...and we have no basements or attics! My closets look the same. My walk in closets now has more Christmas decorations than clothes! I know, I know. You are hoping an organization system will sponsor you, right? Thanks for baring your soul and making it "real". I actually do lots of organizing for friends but we'll all be waiting for your organizational system blog!! It looks pretty good to me! I love it when bloggers show us behind the scenes! Your home and taste are one of my favorites! The first picture is just breathtaking! So lovely! Wow!!! I wish I were as "disorganized" as you!! Collecting beautiful things and using them is a great pleasure of mine and has gotten me through many a stressful time. Keep up the great work. I am so enjoying your blog! Love your blog. Could I please ask where you got your duvet above. I have been looking for it forever to match a set of shams that I have had for awhile. Thank you. Kim, thanks for keeping it real! I too have lots of pillows and covers because I also change out seasonally. It's the least expensive way to get my decorating fix. You'll figure it out eventually. I actually have a chest of drawers to keep all my pillow covers and the pillow inserts are in a large plastic tote. If the tote gets to full to shut the lid, I have to purge. But sometimes I don't want a square, I want a lumbar or a round pillow form. I have to have backups and choices. thank you for sharing...you are awesome sweet friend! What is the name of the paint on the bedroom wall? I love it! And it looks great with the gold mirror! I loved seeing all the pretty linens. I too have learned to purchase pillow covers, and not so many pillows. 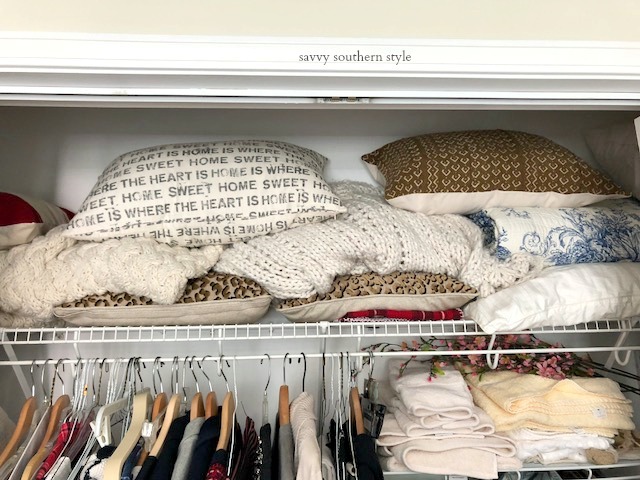 I try to stay in the same size pillows, so I don't have many different sizes.When we want to change out seasons, we tend to purchase more goodies to decorate keeping them quite awhile. I need to pare down and just enjoy- for awhile- my decor. However, I become bored and want new stuff as I don't see the beauty after awhile. Besides, our style changes every few years. Great for you for sharing your pics and info.